1. Are there other criteria that the Committee should consider when adding a substance to the permitted substances list? Yes. Possible interactions with both prescription pharmaceuticals and other natural health products should be considered when adding a substance to the permitted substances list. A history of safety issues and patterns of historical misuse of a substance should also be considered. This history should be gathered from reliable sources located globally, not just in New Zealand. 2. Of the criteria proposed, are there any that you think should not be considered by the Committee when adding a substance to the permitted substances list? No. All of the proposed criteria appear to be important for ensuring the safety of substances, and we hope that they all become part of the final criteria used to evaluate substances. 3. Should the criteria to be considered by the Committee be weighted or ranked in some way? Yes. Concern for safety is paramount, so any safety assessment should hold increased weight. 4. Do you agree that full formulation details of proprietary ingredients should be disclosed? Yes. We wholeheartedly agree that full formulation details should always be disclosed to both the Authority and consumers. The safety of consumers relies on all ingredients and amounts being known, and matters of consumer safety should always trump those of commercial interest. We also believe that for consumers to be able to make informed choices about their healthcare, they have a right to know the ingredients of any healthcare product they are taking. 5. Are there substances that could be added to or should be removed from the draft permitted substances list? Yes. Although we did not have the resources to check through the entire list of draft permitted substances, we were very surprised at how long the list was. Ideally we would like to see all substances, outside of those with a proven therapeutic benefit, having to go through a submission process which involves the paying of a fee, rather than automatically being added at no cost. This ensures that due diligence is performed on all substances. likely to cause serious consequences without health practitioner consultation? Yes. These are a good minimum set of conditions. No claims should be made for conditions that do not take into consideration all of these factors. These factors would benefit from being turned into a more formal, precise set of rules, to ensure they are consistently applied to all potential allowed conditions. 7. Should other factors be considered? Yes. We believe that conditions should only be added to the allowed list if it has been found by the Authority that at least one natural health product has been shown to be effective in treating the condition. This would go some way towards showing a plausibility for other natural health products also having the potential to have a positive effect on the condition. 8. Should the factors be weighted or ranked in some way? Yes. The factors that have a more direct effect on consumer health risks should be ranked higher, e.g. the seriousness of the condition. 9. Are there conditions you think should be added to or removed from the draft list of conditions about which health claims may be made? Yes. There are several items on the list of conditions that are prefixed or suffixed with “unspecified”, such as “bacterial infection unspecified” and “allergy, unspecified”. We wonder if some of these definitions are too broad, and should either be removed or replaced with specific conditions. We recommend that time is spent on ensuring this list is acceptable to a range of health professionals (accredited medical science health professionals, rather than alternative therapy professionals) and any relevant professional bodies (again we would prefer to see no alternative therapy professional bodies involved, given their conflict of interest). 10. Are there other criteria that should be included, or should any of the listed criteria be excluded? Yes. We think that it is not enough for evidence to “not conflict with a wider body of evidence”. It would be better to have the reverse of this criteria, that evidence should “agree with a wider body of evidence”. This strengthens the criteria to ensure that a single study would not be considered sufficient evidence, in cases where there has been a lack of research conducted on a product’s efficacy. 11. Are these appropriate sources of traditional evidence? No. Ideally, there should be no mention of historical use when it comes to the marketing of natural health products and no claims should be able to be made about a product on the basis of this traditional evidence. Our understanding is that historical use does not have a good track record when it comes to proving either that a product is able to treat a medical condition, or that the product is safe. The vast majority of natural health products with evidence of historical use to treat a condition have either a) not been proven to actually treat the condition or b) been positively shown to not treat the condition. At least some consumers are likely to be led to believe that evidence of historical use is evidence of efficacy. If this information is allowed to be used in any way for making health claims about a product, those consumers will be misled into thinking that the product is able to treat a health condition. This should be enough of a reason to ensure that historical use is not allowed to be used as evidence for a natural health product. It is telling that the section on traditional evidence in the guidelines is so much shorter than the section on scientific evidence. The scientific method is a well tested way of testing whether claims are true or not, and as such it is necessarily strict about how scientific tests are conducted and what can be considered an acceptable level of evidence. Traditional evidence, on the other hand, is not encumbered by a requirement to prove that its claims are true – merely that its claims are old. Accepting traditional evidence, in any form, is enacting a great disservice to New Zealanders, who rely on the government to ensure they are protected from ineffective or dangerous treatments. If historical use will be allowed as evidence, there are some issues that we have with the guidelines. We do not believe that an individual should be taken on authority when making claims about whether there is evidence of traditional use for a treatment. Written documented evidence of historical use should be a bare minimum accepted, and this should be evaluated critically before being accepted. No matter what the position of an individual in a culture, their claims should be subjected to scrutiny – arguments from authority should not be accepted. We are also worried about the pharmacopoeia that have been listed. We believe that these should not be taken on face value as evidence of traditional use, and that external validation of their claims must be required. Obviously, for any volume first published before the traditional use time period, this would be sufficient evidence that the treatments listed within the volume fit the criteria of traditional use. However, we are concerned that some of these pharmacopoeia may contain treatments that have only relatively recently been used. In fact, any single source that claims historic use of a natural health product should not be taken at face value. Multiple independent forms of evidence should be required before it is accepted that a product has a long history of use. 12. Are there other sources of traditional evidence that should be accepted? No. We are concerned that the existing sources of traditional evidence are already too broad, and that the average consumer will give traditional use claims more weight than they merit. Adding more sources would only exacerbate this problem. 13. Do you think 75 years is an appropriate minimum period of use for something to be considered to be traditionally used? No. We consider that use should only be considered as traditional if it pre-dates the spread of the scientific method in medicine. A useful yardstick for this date is the publication of An Introduction to the Study of Experimental Medicine by Claude Bernard in 1865. At the very least, we believe that a fixed date should be chosen for deciding if something has been traditionally used, to simplify management of which treatment types are considered to qualify or not qualify. If a time period is used (e.g. 75 years), the Authority will need to track when treatments change from not qualifying as being traditionally used to qualifying. Given the large number of natural health products available, this could be burdensome task. 14. Are there other factors we should consider when determining if a type of study is acceptable? Yes. The guidelines suggest linking the level of study considered acceptable as evidence with the risk of using a product. We do not consider this to be a sensible position to take. The level of evidence required should not be linked to the risk of taking the product, but only to the level of claims being made about the product. The more specific and definite the medical claims, the higher the level of evidence that should be supplied. Whether the product is low or high risk, however, should not influence the level of evidence deemed acceptable. 15. Are the types of studies that are acceptable clear? No. It is not clear that all the types of studies listed have a requirement that they are peer reviewed. We believe that this requirement is important and should be explicitly mentioned. 16. Should other types of studies be considered acceptable? No. Some of the existing list of types of studies considered acceptable are already at what appears to be a lower standard than would be acceptable to MedSafe or the Advertising Standards Authority as evidence of efficacy. Any further adding of acceptable types of studies would only risk weakening this consumer safeguard. 17. Are the evidence guidelines clear? No. The Draft Guidelines for Natural Health Products Evidence Requirements document contains several worrying details. There is a statement that “Scientific evidence does not take precedence over traditional evidence”, in the General requirements for evidence section of the guidelines. We are concerned that it is not clear from the document what reasoning has been used to discern that traditional and scientific evidence are equal in this way. It is our understanding that science has made great strides in providing us all with affordable, effective healthcare, whereas most traditional treatments have not been adopted by modern medicine precisely because they have not been shown to be effective. To equate the two forms of evidence is to totally ignore the fact that the scientific method has proven itself time and time again, and has earned the right to be considered a more trustworthy way of proving a claim than has the simple idea that something has been used for a long time. Many treatments that have a long history of use are now known to be dangerous, such as bloodletting and purging. Given that evidence of traditional use is, in effect, evidence that a treatment was developed when we were a lot more ignorant that we are now about medicine and healthcare, we strongly resist the idea that the two should be given equal footing. This principle of not accepting scientific evidence over traditional evidence leads to the unfortunate statement later in the guidelines that “Traditional claims that have been scientifically proven not to be correct can still be made”. We believe that this is unacceptable, and that if there is good quality positive scientific evidence to show that a claim is false, that claim should not be allowed to be made at all – including in the context of historical use. We believe that all evidence should be available in English. The guidelines state that “The evidence that you hold to support your claim must be in English, or you must be able to provide a verified English translation if requested by the Authority.“ We believe that it is important to allow consumers to be adequately informed, and as such an English version of any evidence held should always be made available in an easily accessible format. We would like to see provision made for consumers to have access to the full text of any studies cited in support of a health benefit claim. It would be disappointing to have natural health companies making claims that cannot be readily verified because the studies cited are locked behind a paywall and out of reach of consumers due to the cost involved. Given how often we have seen natural health companies claim that a study supports their position, where a subsequent reading of the text has shown that the company has either accidentally or deliberately misconstrued the results of the study, we feel that making it easy for consumers to verify a given summary of a scientific text would be beneficial. We believe that these claims are all likely to mislead consumers into thinking that a product is effective for a given health condition, and as such the new regulations should require evidence for these claims. For products that come under the purview of the new regulations, we would like to see provision to ensure that companies don’t deliberately use vague claims to avoid having to supply supporting evidence. For example, non-specific claims about “the immune system” or “mental wellbeing” should not be allowed. 18. Are there other evidence-related topics that should be included in these guidelines? 19. Do you agree with the proposed Code of Manufacturing Practice? No. We have problems with the general thrust of the Code, as it is summarised in the consultation document. We see no reason for there to be any gap between the legislation and the Code of Manufacturing Practice coming into force. We hope and assume that most natural health product manufacturers are already following a code of manufacturing practice that is closely aligned with the proposed new Code, and so meeting the requirements of this Code should be a quick and simple task. We also strongly disagree with the principle that the manufacturing regulation of natural health products should be proportionate to the risks of their use. We feel that manufacturing risks are independent of the risk of a product’s use, as these risks come from outside of the intended use of a product. For example, contamination of a product is an equally risk-laden issue whether the product itself is considered low risk or high risk . 20. How frequently should audits be required? Should this differ for different levels of risk? We agree that it is acceptable for audit frequency to depend on risk. We think that the risk level should be informed by such measurements as the history of a manufacturer’s prior infringements and the compliance history of the product with other manufacturers. We do not agree that there should provision for any manufacturer to be exempt from auditing. 21. Do you think there should be exemptions from manufacturing licensing? No. If anything, small volume manufacturers of natural health products have a greater potential to create products that carry risk. All consumers deserve the same protection, whether they are purchasing a product from a high volume manufacturer or a small scale manufacturer. 22. Are these the right things for the Authority to charge for? Are there other things for which the Authority should charge? We are not concerned with the services that the Authority will charge for. 23. Are the charges structured appropriately? We are not concerned with the structure of the charges. 24. Do you have any comment on the proposal that notification be for a July–June financial year, and/or the proposals to handle the transition period? 25. Do you have any comment on the level of the charges? Ideally, we would prefer to see the product registration system as an approvals based system rather than a notification system. We think that an enforced check of all product registrations should be performed, and that the natural health products industry should bear the cost of this process via product registration fees. We would like to see the Authority make provision for a robust, proactive, transparent complaints procedure. Ideally this procedure would involve the proper consideration of all complaints laid before it, rather than a cherry picking of only those complaints deemed to be the worst offences. We would also like to see this procedure made as transparent as possible, with the complainant kept informed at all stages of a complaint’s processing, and information on complaints and their outcomes made public on a website. The website should also allow for online complaint filing, and have clear instructions on how to make a complaint and what kinds of issues merit a complaint. 26. Do you have any comment on the assumptions around volumes each year? Would you expect higher volumes in the first year? 27. How many products do you anticipate notifying initially, and in the next two to three years? No, we have no expectation around this. 28. Do you agree that manufacturers are best placed to commission any quality control activities, such as audit, that might be required by the Code of Manufacturing Practice? 29. Are there additional issues relating to fees and charges that you would like us to consider? 30. Do you see a case for reducing fees for very low-volume products? No. Fees should be reduced in circumstances where it can be shown that associated costs are lowered. However, we do not see how a low-volume product would entail a lower cost to the Authority in managing the product registration, and so we do not believe that these products should qualify for reduced fees. 31. How would you define very low-volume products? We believe that any natural health product, even one that is custom made for a consumer with a volume of only a single unit, should be regulated. Therefore, although we have no recommendation of an upper limit for what is considered low-volume, our lower limit would be 1.
any other issues that might be associated with low-volume products? 33. Do you agree that labels should meet the proposed presentation requirements? Yes. There should be a procedure in place to ensure all labels meet the requirements before a product can be sold, and a process for consumers to report products that fail to meet the labelling standards. 34. Are the proposed minimum labelling requirements the right ones? Yes. The labelling requirements are well thought out, and will help to protect consumers through allowing them to be sufficiently informed about the product. 35. Should product labels include unique identifiers? Yes. Unique identifiers should be on all labels, and there should be provision for this identifier to be searchable in an online product database of all registered natural health products. 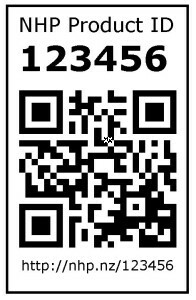 Given the proliferation of internet enabled smartphones, we would like to see this process made as simple as possible by the inclusion of a QR code on labels as an added unique identifier. This code, when scanned by the consumer’s smartphone camera, would open the product registration webpage in a browser on the consumer’s phone. The technology to allow this to happen is already freely available, so the cost to add this feature would be minimal. 36. Is there any other information that should be included, or should any of the listed information be excluded? Yes. We believe that intended purpose of the product should only be allowed to be included on the label if there is scientific evidence to underpin the claim. We do not consider historical evidence alone to be sufficient to warrant the inclusion of a claim that the product is able to treat any medical condition. Traditionally used for x. This is not evidence that this product is able to treat any medical condition, only that it was believed to do so in the past. 37. Is there information that you think should be included in, or excluded from the notification process? Yes. We think that, along with the summary of evidence, a summary of risk should be included. Manufacturers should be expected to have researched any risks associated both with each active ingredient and with the formula of ingredients. Any adverse effects recorded in medical journals or databases from around the world should be summarised and included in the report, along with links to the source data. 38. What information that we are proposing be notified do you think should not be made publicly available and why? None. We believe that full transparency is important to allow consumers to make an informed choice about their healthcare. 39. Should products that sell in less than a certain quantity per year be exempt from notification? No. We believe that any exemption to notification is a risk. If exemptions to notification are to be allowed, this should be related to risk. We do not consider the quantity sold to be a reliable indicator of reduced risk to the consumer. 40. Should products for which the annual sales amount is less than a certain figure per year be exempt from notification? No. Similarly to question 39, We do not consider the annual sales amount to be a reliable indicator of reduced risk to the consumer. 41. Should exemptions on other grounds be considered? No. We think that the exemptions listed in the consultation document, for one-off products and homeopathic products, will both increase the risk to consumers. The only way to ensure that these products are safe is to subject them to the same regulations as other natural health products. The ingredients in the product could be unsafe. Consumers may delay seeking conventional medical treatment. Products could be manufactured in an unsafe way. We consider all of these risks to apply to both homeopathy and one-off products, as much as they do to other natural health products. This health product has been exempted from regulation by the Natural Health Products framework. Any health claims made by this product have not been vetted in any way. We are concerned that if homeopathic and other exempt products are not covered by the new regulations, consumers will assume that they are covered and will not notice the lack of regulatory labelling on these products. As such, the warning above would need to be made obvious on the packaging. 42. To be fair to all product notifiers, how should requests for exemptions be verified to ensure they actually qualify? We believe that exemptions are anathema to the idea of ensuring consumer safety. We hope that no ad hoc exemptions would be accepted, as they would allow a product to bypass this scheme – a scheme which is rightly designed to protect consumers. 43. Are there any additional purposes for which you think the Authority should also consider recognising other authorities? 44. Are there any purposes for which you think the Authority should not consider recognising other authorities? 45. What other authorities do you think the Authority should recognise and for what purpose? As we have said previously in this submission, we believe that product registration should be an approvals rather than a notification system. We think that MedSafe would potentially be a proficient authority for tasks such as analysing the scientific evidence for product approvals. 46. Does the flow chart to determine if your product is a permitted natural health product make sense to you? Yes. We wonder if an interactive version of this flow chart would be a useful addition to a Natural Health Product website that we presume will be created – maybe a list of questions with Yes/No buttons to answer them. 47. Are there other considerations that we should take into account? We hope to see the Natural Health Products website become a useful resource for finding information about all information useful to consumers, such as registered products (including full ingredients, the evidence summary, etc), deregistered products, permitted substances, allowed conditions, consumer complaints and manufacturer fines. To that end, we would like to see that an API is placed in front of this data to allow easy access, in accordance with the government’s commitment to Open Data. We also hope to see the website make use of modern technologies such as responsive design and Microdata, along with extensive hyperlinking, to make the site intuitive and easy to navigate on handheld devices as well as full sized computer screens. We thank the Ministry of Health for giving us the opportunity to submit our thoughts on this new, important piece of legislation. We hope that our ideas are helpful in finalising the specifics of the bill and associated guidelines, and we would be keen to engage further with the Ministry on this topic in any way that we can help.